Functional eccentric training is something we are going to be talking about in the office for quite a while because reACT, the newest addition to the BStrong4Life program is finally here. reACT is a functional eccentric trainer, and what that the heck is that you might be asking. 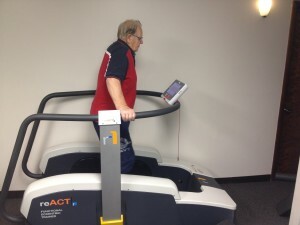 To describe the reACT machine we must first discuss eccentric exercise. Eccentric loading is a key component of many of our daily activities as well as athletic events. Eccentric loading can best be described as the landing phase of walking and running, walking down stairs or a hill, landing from any jump, squatting down to lower an object of pick something up from the floor, any activity where someone is on their feet running with sudden changes in direction, decelerations, or stops, decelerating the arm when throwing, and downhill skiing. Eccentric loading is involved in almost all of our daily activities and most sports but eccentric training is not a common component of the average person’s workout including the average athlete. To better understand eccentric loading and training it is important to review isometric and concentric muscle contractions. movement. Muscles are capable of producing much more force eccentrically compared to concentric or isometric. During an eccentric contraction, force production comes from the contractile element of the muscle and the connective tissues such as the tendons. During isometric and concentric contraction force production comes only from the contractile element of the muscle. Eccentric force production increases as the speed of movement increases but during concentric contraction the opposite is true; force production decreases with increased speed. for seniors and those with decreased cardiovascular capacity because it quickly and safely builds muscles and decreases fall risk significantly without overtaxing their cardiovascular systems! Client using the reACT for his first time. The reACT functional eccentric trainer allows us to train our patients eccentrically but also helps them improve their balance, stability, and movement patterns. reACT uses a platform which rotates in a reverse elliptical pattern which forces the lower body to absorb the kinetic energy of the platform with no impact. 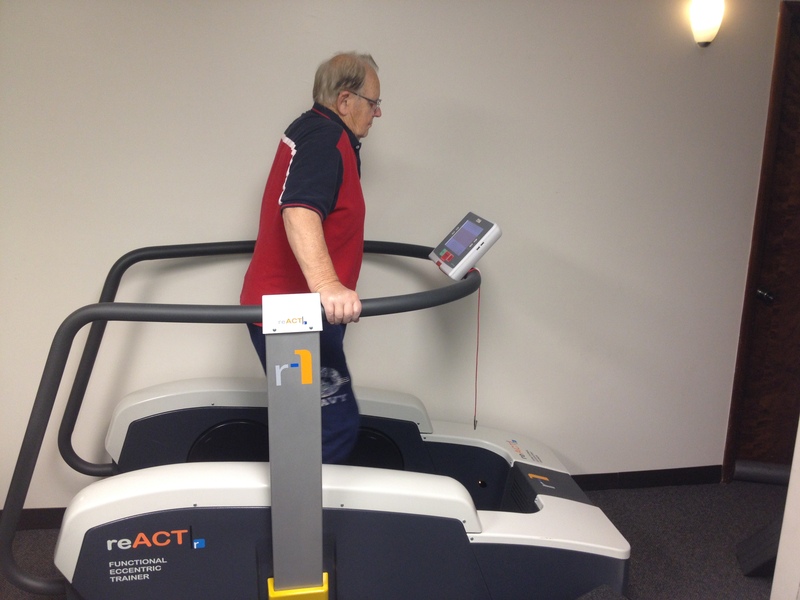 By controlling the platform speed and posture the level of challenge can be precisely matched to the user so that it can be used by a wide range of abilities from seniors to Olympic athletes. learn more give us a call today, we would be happy to take you on a tour of our office and give you a sample of how BStrong4Life can add years to your life and life to your years.